One in eight American teenagers considers suicide, a new report reveals. And the one in five who are bullied are over three times more likely to consider ending their own lives. The US is in an undisputed mental health crisis – especially when it comes to teenagers, for whom screen time and mounting pressures are becoming increasingly unbearable. LGBTQ students, as well as girls, are also bearing the brunt of bullying and suicidal ideation alike, a report from Insurance Quotes found. Earlier this year, the Pew Research Center reported that anxiety and depression are the greatest concerns to American teenagers. Far more youth are worried about their peers’ mental health than their involvement with gangs, getting pregnant or drinking. Although the number who saw bullying as a problem among their peers has fallen from previous years, peer-to-peer harassment remained the second greatest concern to teenagers. And with social media keeping them connected at absolutely all times, there’s no safe time for teens when they are totally out of reach of their tormentors. More middle and high school students were bullied at school or otherwise in-person than online, but significant proportions of teenagers suffered in both environments. One in five American teenagers endures bullying at school and one in seven suffers online harassment, the report found. Different groups of kids suffer different kinds of bullying, the study found. Both homosexual boys and homosexual girls were the most constant targets, online or at school, the study found. And girls of any sexual orientation were bullied more than their male-identifying counterparts. Girls who identify as lesbian were most likely to be on the receiving end of mean and derogatory behavior online, while boys who said they were gay were at greatest risk of being chased down by bullies at school. For the most part, smart phones and social media are suspected to play a role in damaging the mental health of America’s hyper-connected youth. But research has struggled to prove that, returning mixed results on the effects of these technological advancements. The experts who analyzed the CDC’s data on behalf of Insurance Quotes think there may e a direct link, however. And they aren’t the first. Several recent studies have suggested that cyber bullying increases right in line with children’s and teen’s cell phone ownership. 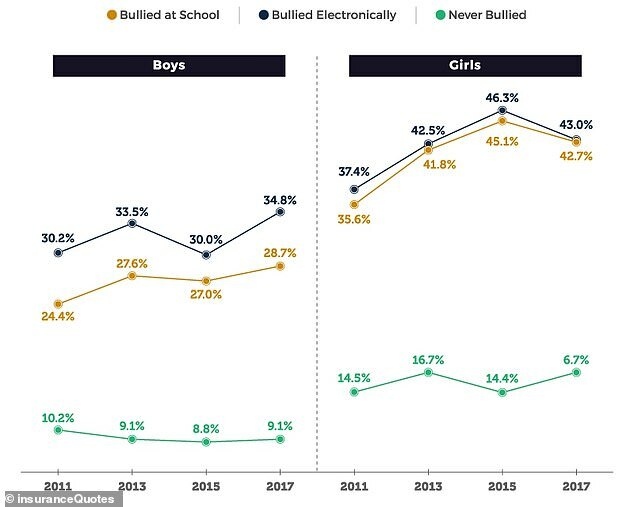 Last year, one American Academy of Pediatrics study found that even in third grade, half of in-school bullies had cell phones; so did a shocking three-quarters of cyber-bullies. But only 37 percent of kids that weren’t involved carried a phone. Taken together, that research and the new Insurance Quotes analysis paint a worrying pictue. If more cell phones mean more bullying – and more relentless bullying – and more bullying may be driving suicides, cell phones could indeed be contributing to the rising rates of suicide among children and teenagers. In 2016, 6,159 people between ages 10 and 24 took their own lives. 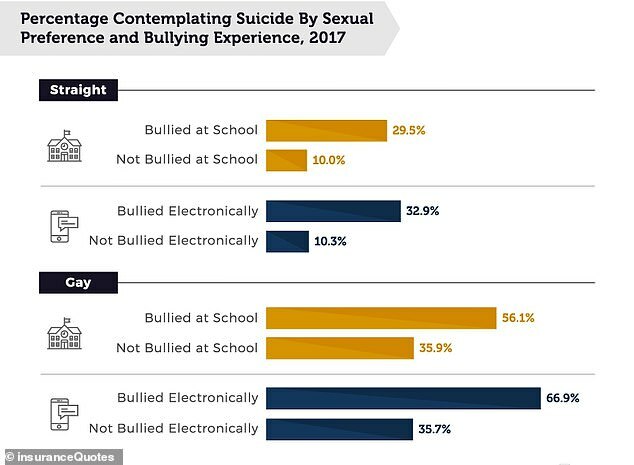 Nearly 35 percent of boys who had been bullied electronically said that they had had suicidal thoughts, as did 29 percent of boys bullied in school, according to the new Insurance Quotes report. Rates were even higher among girls. Around 43 percent of girls bullied online and at school had contemplated suicide in 2017 – and that was down from 46.3 percent who were electronically bullied in 2016. And a horrifying two-thirds of gay students who had been bullied online had thought about suicide. It isn’t clear how many of those students had cell phones, but the devices are approaching ubiquity among high school students in the US. The link between cell phones and suicides may still be somewhat tenuous, but the connection between access to weapons and suicide is well established. Rates of suicidal ideation, bullying and carrying a gun to school tracked each other closely in the new study. 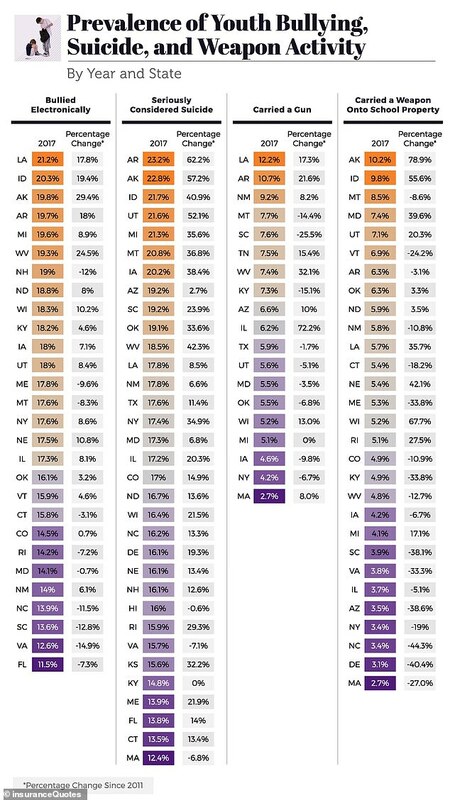 Arkansas, where gun laws are relatively lax, for example, was in the top three percentages for electronic bullying, suicidal ideation and carrying a gun onto school property. Over 10 percent of kids there said they’d brought weapons to school, 20 percent had been bullied online and 23 percent had seriously considered suicide. The Insurance Quotes researchers are urging US officials to treat bullying as a real and present danger. ‘We must regard bullying as a pressing issue for the nation at large,’ the authors wrote.